In Greek mythology, the hero Jason sailed the Argo in search of a golden fleece that would prove he was the rightful king of Lolcos, an ancient city. His crew members were called the argonauts. Today, the Jason satellite looks down on the world’s oceans, overseeing the Argo network. His argonauts are data-broadcasting floats, and his search is not for a fleece but the effects of rising oceans. NASA and the French space agency launched the first satellite in the Jason series in 1992. All three iterations of the satellite have had an altimeter – a range-finding instrument – to measure distance to the ocean’s surface. The current satellite can measure ocean topography down to a few centimeters’ height. 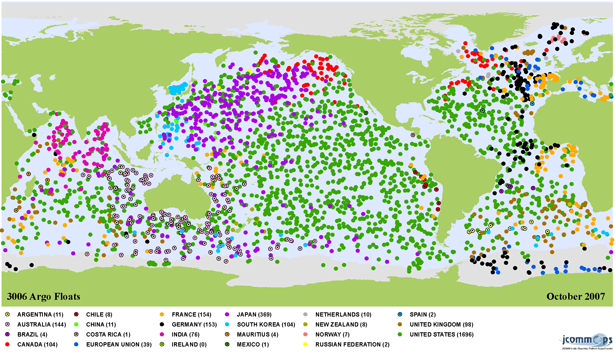 Combine that with a network of 3,600 monitoring floats and scientists can get a very accurate view of ocean change. But the tale of how today’s extensive Argo monitoring network came about is a bit of an odyssey. Johnson said it wasn’t long after those developments that the Scripps Institution of Oceanography decided to have its floats surface every 20 days or so and transmit their locations. Scientists began equipping floats with sensors and technological advances made a network possible – a grid of floats constantly monitoring all over the world, requiring international cooperation. The first floats were deployed in 1999 by Australia and then the U.S., Johnson said. Their number had reached 3,000 by 2007. Many partnering countries help by giving access to their territorial waters. Some have even offered space on their ships for float deployments. Other contributing countries include China, India, Japan, and many in Europe. Independent researchers, usually from universities, have deployed floats and volunteered the data collected for inclusion in Argo’s publicly available database. Johnson said the data have been used by climate scientists, military interests, fisheries and meteorologists. The data have also contributed to weather forecasts, search-and-rescue missions and responses to oil spills. Each float is about 3 degrees longitude or latitude from the next one and operates by drifting with the currents at a depth of 1,000 meters for 10 days, then sinking to 2,000 meters before rising to the surface while taking readings. Most floats have been equipped with sensors to monitor conductivity, temperature and depth. Johnson said the entire array, with each float monitoring on a 10-day cycle, needs only 60 watts of power, or about as much as a standard incandescent light bulb. Its efficiency is impressive, but so is the system’s role: providing information important to understanding global warming and how the oceans are changing. Looking at data over time is a key advantage the network provides to researchers. Johnson said the world’s oceans play a larger role in climate circulation than many people realize. NOAA, the Scripps Institution of Oceanography, University of Washington and the Woods Hole Oceanographic Institution work together to maintain the U.S. portion of the Argo network. As of December 2012, the worldwide network had collected more than one million data profiles and provided data for more than 1,250 research papers.